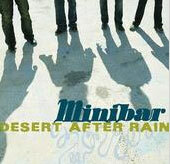 Minibar may be from England but their understanding of Americana makes them one of the leading contenders for roots rock relevance. The band’s new album, Desert After Rain, is a riveting addition to their still-budding catalog and one that takes then to a new level of artistry and accomplishment. Following the dissolution of their major label affiliation with Universal, this latest effort finds them going out on their own, a move that’s echoed in the resolute determination reverberating through every one of these offerings. These are numbers about love and loss, from the opening anthem “Things I Left Behind” to the album’s exquisite send-off, the haunting ballad “In The Strings.” The songs sandwiched in-between find an ebb and flow in tone and temperament, but remain steadfast in their unflinching reflection. The feelings are manifest in the longing of the evocative “Biker Night,” the rock-steady, love-struck revelation of “The Sight Of You,” and the unbound optimism of “Wide Open.” There are many moments of that sort scattered throughout, creating the sort of palpable emotional resilience that many artists attempt and few achieve. To their credit, Minibar reside with the latter.